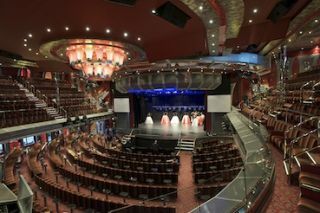 Powersoft's green audio power is behind the audio systems installed throughout the Costa Fascinosa, the new flagship of Costa Cruises and the largest Italian-flagged cruise ship afloat. Powersoft M series, Duecanali and Ottocanali amplifiers drive sound systems in the restaurants, chapel, library, casino, theater, pool, fitness center and spa, dance lounge and disco, bars, and meeting and multifunction rooms on-board this latest addition to the vacation cruise fleet, which set sail on its maiden voyage from Venice, Italy in early May. The 114,500-ton, 3,780-passenger ship Costa Fascinosa-the name, chosen through an online competition, means "fascinating" in Italian-was designed by well-known cruise ship architect Joe Farcus, who took inspiration from motion pictures such as "Gone With the Wind," Fellini's "Amarcord" and "Slumdog Millionaire." But while the interior design evokes the glamour and opulence of bygone eras, flexibility and versatility define the on-board audio system. Installed Powersoft models include M14D (two channels, driving 700W on 4 ohms), M50Q HDSP+ETH (four channels, each generating 1250W on 4 ohms), and Duecanali 3904 and Ottocanali 1204 (eight channels, 150W on 4 ohms or 125W on 70V using BatFormers, the optional plug-in output transformers) amplifiers.